The general protection of the environment and the conscious use of natural resources is part of our fundamental business philosophy here at EMKA. The continuous execution of planning and implementation of the production flow, as well as technical changes to the building, are all visible consequences of this environmental awareness. This approach has resulted in the regular issuing of certification according to the international environmental management standard (DIN ISO 14001) by Germanischer Lloyd since January 2007. 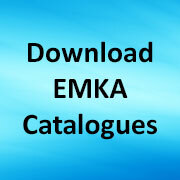 Share the post "Green production at EMKA"